One of the less well-known sites of the former main concentration camps within Germany, in a remote corner of Bavaria. Forced labour in a nearby quarry and later in other industries was the main purpose of the camp. After WWII, the site was long rather neglected, but in recent years it has been brought into line with other memorial sites of its type in Germany, with the establishment of modern, state-of-the-art exhibitions. It remains an unusual example of such sites, however, due to its park-like appearance which these days starkly contrasts with the grim history of the place. More background info: Flossenbürg was a Nazi concentration camp set up in May 1938 in a remote southern corner of Germany near the border with the already annexed Sudetenland (today in the Czech Republic). It primarily held political prisoners and POWs, who were exploited for forced labour, especially in the nearby quarry, but later also in arms production. The location had in fact been specifically chosen because of Flossenbürg's history of quarrying of high-quality granite. And that was the stuff needed by the Nazis for their ambitious programme of construction of megalomaniacal representational buildings, such as in Nuremberg or Berlin. The camp's main purpose was thus no longer simply imprisonment of political opponents (as initially with the founding of the earliest camps such as Dachau); here the exploitation of labour was the main raison d'être for the establishment of the camp. As such, Flossenbürg served a role similar to that of the better-known camps Mauthausen in Austria or Natzweiler-Struthof in (what is today) France. From 1942, Flossenbürg's role extended to arms production on a large scale too. A factory producing parts for Messerschmitt Me-109 fighter planes was established at Flossenbürg, and over a hundred satellite camps were set up in various locations in the area to provide the slave workforce for yet more war-relevant industries. Up to 100,000 inmates from some 45 different countries are believed to have passed through the camp, of whom as many as a third may have perished. Flossenbürg was primarily a men's camp, although more than 15,000 women were also held here (or rather mostly in sub-camps). In this context Flossenbürg also gained notoriety as a training camp for female concentration camp guards (see also Ravensbrück). As in other camps, living conditions were extremely harsh, compounded further by the nature of the hard labour inmates were forced to perform, under conditions of systematic malnourishment, camp guard brutality and practically no safety precautions in the dangerous quarry. The damp and cold climate also did its bit to make Flossenbürg one of the concentration camps with the worst of reputations. Many inmates had been transferred here from other camps, such as Dachau or Buchenwald, and found Flossenbürg to be even worse than those … which is saying something! In addition to the death toll incurred through those conditions, aptly named by the Nazis "Vernichtung durch Arbeit" ('extermination through labour'), there were also routine executions, even on a mass scale. The main site for such mass executions was the hillside just to the east of the camp, which gained the epithet "Valley of Death". Like Sachsenhausen or Dachau, Flossenbürg also had a special cell block for "prominent" inmates, mostly high-ranking political prisoners. One of them was Dietrich Bonhoeffer, a pastor who was a leading figure in the resistance movement within the church, and as such quite an exceptional figure! He was finally arrested and transferred to Flossenbürg via Buchenwald, when his involvement in conspiracies to assassinate Hitler were uncovered. He was executed on 9 April 1945 just weeks before the camp's liberation (and Hitler's suicide!). Another well-known name associated with Flossenbürg is that of Admiral Friedrich Canaris, who represents resistance against Hitler within the German military during the Nazi reign – the best-known act of which was of course the July 1944 assassination attempt by Stauffenberg (see Wolfschanze). Canaris wasn't himself involved in Stauffenberg's coup but had apparently made his own plans and was also in contact with the British secret service. He was executed the same day as Bonhoeffer – on direct orders from an enraged Hitler, soon after Canaris' diary had been found. Meanwhile, as Nazi Germany was losing the war in the east, transports of prisoners from "evacuated" camps in Poland had arrived in the German camps including Flossenbürg, and conditions deteriorated even further for the general inmates. Some parts of the camp were set aside as nothing but "death barracks" and the final year of the camp was accordingly its deadliest. Only in this phase was there also a sizeable Jewish contingent amongst the prisoners at Flossenbürg. As the Allies were approaching, many concentration camp inmates, including Flossenbürg's were then sent on the so-called Death Marches to transfer them to areas not yet conquered by the "enemy". When the liberators of the US Army finally arrived in Flossenbürg as late as 23 April 1945, they found only 1500 inmates left in the camp who had been too critically ill to even move on the death marches and had just been left behind to wither away. Tragically, for many of them even liberation did not stop the dying … it was simply too late. The Death Marches cost further lives – and the dead were just hastily buried by the roadside (if at all). The US occupiers later made the German populace help in the reburial of these, usually in local churchyard cemeteries. Ironically, many of these were later re-buried yet again, this time back at Flossenbürg. As my guide at the memorial commented: had it been possible to ask any of them, none would have agreed to being returned to this evil place. But it was part of the early phases of post-war Germany's coming to terms with its recent dark history – mainly through forgetting or blocking the memory out. This affected the site of the camp itself too, which was long neglected and much had been allowed to fall into disrepair or was demolished. Even private housing estates and local industries used parts of the former camp's grounds. What was left as a memorial became significantly altered, as the grounds were landscaped into what today looks surprisingly tranquil and green. Three of the camp's watchtowers were left standing, the rest were taken down and their stones used in the construction of a memorial chapel, next to the more or less merely symbolic/cemetery part of the memorial, which was inaugurated officially in 1947, as one of the earliest of its kind. However, most of the camp's authentic area was then gradually "reclaimed". Even those buildings in and outside the camp that hadn't been torn down were put to new uses, including the former SS mess which was – would you believe it! – converted into a regular café/restaurant. The quarry continued to operate as such and still today remains a local business (unlike e.g. at Mauthausen!). Some villas of the former SS housing estate continue to serve as private homes. The demolition of the former cell block of the camp's prison could at least just be stopped before completion, so that a small part survives. The largest structures still standing are the former Kommandantur (the camp's administrative HQ), now housing the memorial's administration offices, and the two large buildings on either side of the former roll-call square, which used to be the laundry and the kitchen blocks, respectively, and today house the memorial's museum exhibitions. The main memorial museum finally received a major upgrade in 2007, when a new larger-scale exhibition about the camp's history was opened in the former laundry block. The ceremony took place in the presence of surviving former inmates, as well as Ukraine's then president Viktor Yushchenko, whose father had been incarcerated at Flossenbürg for five months. The whole site had only been declared a protected memorial three years earlier. But in the end, over 60 years after the camp's liberation, it was brought into line with Germany's contemporary commemoration culture. Its new exhibition is indeed excellent – and even won a Bavarian Museum Award in 2011. Better late than never! What there is to see: the place does not strike you as the typical concentration camp at all when you first get there. There are no barracks, hardly any desolate looking open spaces, no gatehouse, no "Arbeit macht frei" and the few buildings of the original structures still in situ are atypical in appearance too. The most prominently visibly original building is the large stone-building that was the camp's "Kommandantur" or 'administrative HQ' of the SS that ran the camp. Today it is still reserved for administration, now that of the memorial site, and its interior remains inaccessible to regular visitors. The publicly accessible memorial site begins beyond where the camp's gate would have stood. This is no longer there, however. In fact, Flossenbürg never had a proper gatehouse in the form familiar from larger camps such as Sachsenhausen, Buchenwald or Dachau. There were merely two granite (of course) posts on either side – and one of them had a plaque with the usual "Arbeit macht frei" on it ('work sets you free' – most familiar from the metal sign over the entrance to Auschwitz I). This is now gone – and the two granite gateposts have been moved to the back of the memorial near the crematorium. The open space you then enter is what used to be the roll-call square – where inmates had to stand for prolonged periods of time in the early morning and again in the evening after work shifts – and sometimes as extra collective punishment or to watch public executions. The orangey, cream-coloured buildings either side of the open square are the former laundry to the right and the former kitchen block to the left. Today, these house the memorial's two exhibitions. We'll come back to them later. If you first continue to the area behind the main exhibition building you enter the park-like earliest part of the memorial area – the larger part of which lies actually outside of the original camp perimeter. Here some 5000 of Flossenbürg's dead victims of were re-interred after they had been collected from various mostly death-march related locations in the surrounding area. At the far end of this cemetery part stands one of the three remaining stone watchtowers. In front of it you can see a fenced-off opening in the ground which looks like a cave or mine entrance. This used to be the upper end of a kind of "chute" ramp the SS built to speed up the process of getting the increasingly large numbers of dead in the camp down to the crematorium. The steps behind the watchtower lead down to the crematorium, which still stands, and to the left you can see the raised ramp bit going down towards it … the carts delivering the corpses to the crematorium would have run along this. Also note the remnants of the electrified camp fence as well as the relocated granite blocks of the former camp's main gate. Inside the crematorium itself you can see its single oven and a dissection table, on which gold teeth were extracted from the dead inmates before they were cremated. As the size of the oven may already indicate, it was not sufficient to cope with the numbers of dead at "peak" times … so they were also burned out in the open on wooden racks and with the aid of petrol. The ground below the crematorium was also the site of mass executions (shootings) … which gives two reasons why the place is now referred to as "Valley of Death". This has been landscaped in a park-like fashion too. In the centre is a mound called "pyramid of ashes", though you wouldn't guess this now, given its cover of green grass. Around it are more symbolic graves and memorial stones, as well as a whole square-ish area lined by stone slabs representing many of the nations that victims came from, some marked with the respective flags. Climbing the stairs at the opposite end takes you up to the memorial chapel, which was constructed as an early specially dedicated memorial. In fact, the stones used in its construction were taken from demolished camp watchtowers. You can tell by comparing the chapel walls with the remaining watchtower standing right next to it. A third watchtower towers higher above the whole area on the hillside, completely surrounded these days by dense forest. Note the two glass jars on the walls flanking the altar area – these contain ashes recovered from the grounds of the camp. The altar itself is noteworthy in that it represents on the one side an inmate being beaten by another inmate – the latter obviously a Kapo (overseer of regular inmates). On the other side of the obligatory central cross with Jesus on it stands a female figure carrying rocks and a child at her feet – even though women were the exception in Flossenbürg. Completely absent is any representation of the SS or other Nazi perpetrators. Walking back towards the central part of the camp you pass a modern white building which is the Jewish memorial – constructed in the 1990s. The inside is mostly bare, except for a single Hebrew inscription (which translates as "remember!"). An opening in the ceiling projects a Star of David onto the floor. Along the southern rim of the memorial area you can find the remains of the camp's prison block. It was here that the "special prisoners" were kept, in small isolation cells. These included Admiral Canaris and pastor Bonhoeffer, who were both eventually executed here (see under 'background' above). A memorial stone specially commemorates them. The small part of the cell block itself that is still standing has two cells with original doors but is otherwise empty. The indication of foundations of barracks beyond the prison block mark the location of the "Sonderbau" or 'special building'. This euphemism stands for the camp's brothel! Indeed, the Nazis set up brothels inside their concentration camps – not for themselves, but to offer special incentives for "good" inmates who showed particular obedience and efficiency. As rewards, "premium tokens" could be acquired and redeemed for extra food rations or for a visit to the brothel. The women "serving" in the brothel were typically from other camps (especially Ravensbrück) and brought here under false pretences or wrong promises of freedom if they complied for a short while. It is a part of camp history that to this day remains rather reluctantly covered by the memorials. Had it not been for the guide giving the tour around the site, I would have missed the location of the "Sonderbau" completely. Now to the exhibition in the former laundry building. The main part is on the upper floor and chronicles the history of the camp from 1938 to 1945. It consists of a good and well-balanced mix of photos, documents, explanatory texts, a few artefacts and multi-media elements such as video screens and audio stations. As you might expect from a site that had so long been comparatively neglected, the exhibition isn't particularly strong on original artefacts, but it balances this out with a distinct focus on individual personal stories – a deliberate approach chosen to counter the fact that victims were so deprived of their individuality by the camp system. Several of the survivor victims feature repeatedly and provide a subtle kind of thread. A set of computer workstations provides additional information about Flossenbürg's numerous satellite sub-camps. This information, however, is in German only. Most of the exhibition, in contrast, features English renditions of all texts in very good translation quality (which isn't always to be taken for granted … cf. e.g. Buchenwald). Other languages are represented only through summary leaflets you can pick up at the reception desk/shop at the entrance. Downstairs on the lower floor and in the basement, more sections follow. Firstly the original disinfection and shower rooms. Note the green coloration of the floor in the former … most likely from the chemicals used (such as Zyklon B – cf. Majdanek). The large main shower room is particularly eerie – even though the overhead shower heads are gone (and of course were never used for gassing – neither here nor anywhere else, despite that common misunderstanding about the Holocaust …). Secondly, the basement part continues the exhibition with yet more focus on personal stories – ordered by nation/groups of victims. You can even consult a shelf of folders providing extra information on numerous individual cases. In a special cinema room a 23-minute documentary film complements the exhibition. It is screened every half hour in German and in English once daily at 2:30 p.m. – a copy of the film is available on DVD at the museum shop for 10 EUR (and the shop also has various printed material). The film features survivors detailing their experiences at Flossenbürg. Unlike at other memorials, this is not an "introductory" film but rather a document of personal comments and memories. As such it makes more sense to go and watch it after having gone through the main exhibition rather than before doing so. It is very touching viewing indeed. Do not miss this! In the parallel building, which used to be the camp's kitchen block, a new second exhibition has more recently been added: this is about the post-war history of the site and about Nazi crime commemoration in general. On the one hand it features a similar blend of artefacts, documents and multi-media installations as the main exhibition, but is very different sound-wise. A key feature here are the loudspeakers hanging under little perspex domes overhead that together provide an eerie general soundscape of numerous voices mumbling simultaneously … only when you step directly under one of the perspex "umbrellas" can you listen to the actual individual soundtracks (German and English) that accompany the display cabinets in question. Topically, the difficult history of remembrance at Flossenbürg is covered – and its long transition from being almost hushed up to its present status as a state-of-the-art memorial. Also, related stories of how commemoration evolved in Germany are conveyed. Some post-war cases against perpetrators are illustrated too. A wall with video screens set into it provides a very unusual and modern type of timeline of how the whole commemoration culture changed over the decades. It's well worth staying a while to take each one of the screens' material in (many alternate between two programmes and all are played in loops). Finally, there is also some temporary exhibition space in this building, which at the time of my visit contained a rather sparse set of panels entitled "Generations" – namely of camp survivors, i.e. witnesses, and contemporary efforts of younger generations to keep that memory alive beyond the survivors' physical lives. Outside the memorial grounds proper, a couple of locations are also of interest to the more dedicated visitor. Note for instance the long building on the hillside above the bus station. This used to be the SS mess and had long been run as a regular café/restaurant. But according to one very enthusiastic lady from the memorial administration that I chatted with, this building has recently been acquired by them and it is planned to convert it into something more appropriate (e.g. accommodation for study groups). She also showed me the way to the quarry – in particular to a viewing platform, which is otherwise not mentioned at the memorial site itself. Remember that the quarry, in which so many of Flossenbürg's inmates were worked to death, is still in use! On weekends you can in theory get to it along the regular access road and have a look. But the viewing platform is more impressive and less restricted, access-wise, though hidden. To find it you first have to get back to the main road, called Birkenstraße and head back downhill towards Floss/Weiden. Then at the sharp corner to the left, take instead the right turn-off by the little kiosk/café (which itself used to be the gatehouse for the quarry back then!). Two roads fork off to the right from here. One is signposted "Ski Lift" and would eventually also take you to the bottom of the quarry. But take the one to the right (Wurmsteinweg) and keep climbing it and you'll pass a boarded-up yellow building – this used to be the quarry's administration building (it is currently derelict and empty – the memorial would like to preserve this original building too, but lack of funds has so far prevented this). Keep going through the woods and past yet more ruins and you'll finally come out on the balcony-like viewing platform. It's not quite like Mauthausen, but still a worthy spot to contemplate the grim historical heaviness of a place like this. More conventional is the little Memorial Cemetery in the lower part of the village – this was set up on orders of the US occupying power, apparently with the deliberate intention of reminding the locals of their village's dark history. But today, it seems rather insignificant-looking compared to the actual site of the former camp. On balance, Flossenbürg is probably not at the top of the list of most dark tourists in Germany – unlike better-known sites such as Dachau or Buchenwald. Nor is it as big as those or as immediately grim in appearance. On the contrary, the green lushness of the grounds at Flossenbürg could almost make you forget what sort of place this is. However, the new exhibitions both do a superb job in putting that right. They're as cutting-edge in the field as can be, certainly rivalling the equivalent exhibitions of well-known camp memorials such as Dachau, and out-doing those of older such institutions. It's definitely worth the detour when travelling through the south of Germany or the west of the Czech Republic (the border is just a few miles away). Location: about 10 miles (16 km) north-east of Weiden (Oberpfalz), which is a small town a good 50 miles (80 km) east of Nuremberg (Nürnberg), Germany; and ca. 100 miles (160 km) west of Prague in the Czech Republic. Access and costs: a bit remote; but free admission. Details: it's easiest to get there by car: either take the A93 motorway (Autobahn) between Regensburg and Hof and exit at Neustadt an der Waldnaab, or take the A6 motorway from Nuremberg to Pilzen, Czech Republic, and exit at Waidhaus. From the motorway, the memorial site is signposted ("KZ-Gedenkstätte Flossenbürg"). To get there by public transport, you can first take a train to Weiden/Oberpfalz. From outside the main station (Bahnhof) there's an hourly (weekdays) or roughly two-hourly (weekends) regional bus: line 6272 to Silberhütte, which, after a long 45 to 55 minutes and many stops, will eventually get you to "Flossenbürg Gedenkstätte" (which is the fifth stop in Flossenbürg – so don't disembark too early!) Make sure to note the departure time of the last bus back to "Weiden Bf" – esp. at weekends, when the service is much reduced. The bus also connects to Altenstadt (Waldnaab) and Neustadt an der Waldnaab (but even less frequently). Opening times: daily from 9 a.m. to 5 p.m., from December to February only until 4 p.m. (note that the screening room for the film closes earlier, at 4 p.m./3 p.m. – and the crematorium is not accessible at all between December and March). Time required: there may not be much left in terms of original structures/features, and these can be explored in perhaps less than two hours (guided tours last 90 minutes, which is a good indication); but the well-made exhibitions alone require a good amount of time to do them justice. At least half a day should thus be allocated – but if you want to go through all the material available in the main exhibition, even a whole day may barely suffice. Combinations with other dark destinations: nothing much in vicinity – except for a few memorial stones in places where Flossenbürg's satellite camps were located; but these are hardly worth travelling for. Definitely worth the effort, however, is a visit to Nuremberg, also as a good contrast, since this was the place where a) the ideology of the Nazi perpetrators was most overtly "celebrated" (covered by an excellent modern documentation centre), b) much of the granite quarried at Flossenbürg ended up in Nazi buildings, and c) where the historic trials against the few war criminals captured took place after WWII. The courthouse where the Nuremberg Trials were held has meanwhile also been turned into/augmented by a memorial. Further afield still are yet more concentration camp memorials, especially Dachau near Munich in the south or Buchenwald near Weimar further north (both a good few hours' drive away). 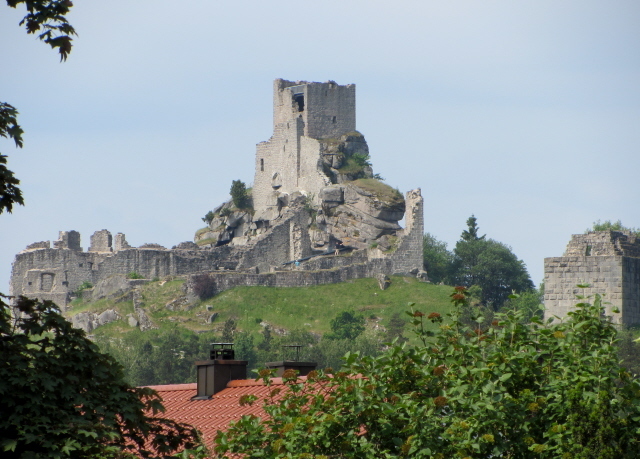 Combinations with non-dark destinations: the main non-dark attraction of Flossenbürg is its ruined ancient castle, perched in an almost impossibly scenic location on a nearby hilltop (you can see it from the memorial site). The whole area is very scenic too, and popular with hikers. Germany's largest and most environmentally intact national park, the Bayrischer Wald ('Bavarian Forest'), is also within fairly easy reach, located east of Regensburg in the south-easternmost pocket of Germany, along the borders with the Czech Republic and Austria.